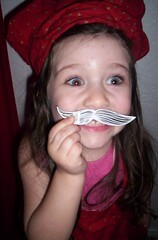 Craftster Community > JEWELRY AND TRINKETS > Trinkets and Jewelry: Completed Projects: General (Moderators: I Sew Cute, Mistress Jennie) > Mustache Necklaces for the WHOLE family! 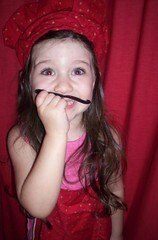 Mustache Necklaces for the WHOLE family! 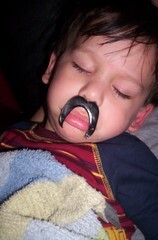 My mom was looking for those eyeglasses with the fake nose and 'stache to take some wacky family pics this week, and I reminded her that my shrinky mustaches are WAY cooler and more original. So, then, I got roped into making them for the entire fam! 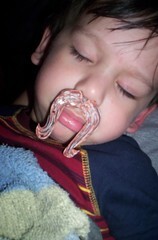 My son fell asleep, so he was a PERFECT mustache model! All 11 of us will model them on Thursday when we get together for our Christmas; I'll post action shots then. Here is the first Craftster post I made where I showed my first one. Re: Mustache Necklaces for the WHOLE family! maude damn woman, those are frikken hysterical! If the orig. poster can't get you some shrinky dinks stuff I would be happy to do it. I think everyone needs to try it! Now on topic. I love those!!! I made one out of clay and had my boyfriend model it and we had wacky picture fun! I made one a few days ago, right after your first post. Now I cant keep up with my friends that want them. Haha thanks for the sweet idea, I will post pics of the ones I make when I get my new digital camera in. Oooh, awesome! I'd LOVE to see! I am currently OUT of shrinky film, (used the last 2 pages to make these!) but it sounds like you got a good offer. I totally spaced that I needed to finish a commissioned painting/collage piece today, so it's pretty silly that I spent 2 hours on those. OOPS! I've looked everywhere for black shrink plastic and can't even find regular shrink plastic! Seems like the stores around me don't carry it anymore...the horror! I do have a supply of non-black shrink plastic, so I think I may be shrinking a bunch and then painting them with acrylics. I have a Christmas party after Christmas (last year it ended up being in April with all of the busy schedules), so I have plenty of time to whip up a bunch of these! And, I love how you have a "villain" side and a "hero" side! ahaha! those are GREAT. and your daughter is absolutely adorable as well. I've lost my sanity; can I borrow yours? i don't know much about it but i think it only comes in clear and you colour it with either coloured pencils or markers. isn't that how you do it? you colour it BEFORE you shrink it too, not after! much better for detail. and you punch the holes first as well. there's some kind of math you can do to figure out the size difference before and after but, meh, me and math don't mix as well as me and crafts! You can get it in black, clear, white, or opaque, and it is better to color first before baking, but you can add more afterwards as well. Yeah, I don't measure either, just guesstimate! One more thing I didn't mention, make sure you only bake 1-2 at at time, cause they curl up so MUCH that it's hard to flatten them when you have a bunch in there (voice of experience here!). Thanks! She's a hoot, that's for sure! Always wearing some crazy outfit or costume.